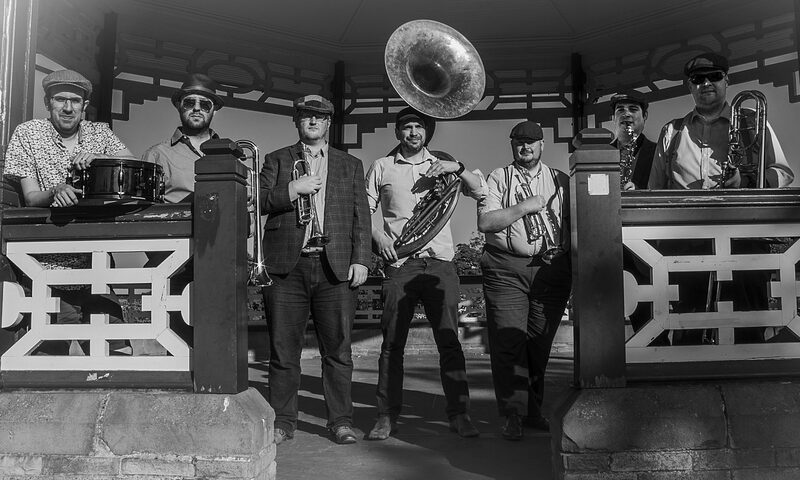 Flat Cap Brass are a friendly Northern seven-piece Funk Brass Band from Yorkshire consisting of 2 trumpets, 1 saxophone, 2 trombones, 1 sousaphone and drums. Our group of professional musicians met at the Royal Northern College of Music in the early 2000s. From the Sid Lawrence Orchestra to the Halle Orchestra and the BBC Philharmonic to Ibiza DJ Jeremy Healy and the Prince Experience, it’s easier to count the professional ensembles in the North of England that these musicians haven’t played with than those they have. With a broad repertoire spanning brass classics and covers of contemporary pop hits, expect to hear the likes of diverse artists from Robbie Williams and Lady Gaga to Ed Sheeran, The Jackson 5 and Survivor recreated in a bold brass sound! Wearing their trademark flat caps, Flat Cap Brass are in high demand on home soil and abroad for their distinctive and engaging performances. With undeniable chemistry between the band members, their energy is infectious and guarantees a fun and enjoyable show. Having played countless international events including weddings, festivals, parties, corporate events, pubs, town events and more, Flat Cap Brass are comfortable in any event setting. Fabulous indoors or out – we won’t disappoint!